For those wondering how many oil jobs were lost in 2015, Forbes reported on Oct. 22 the number had surpassed 200,000 worldwide. While the exact figure is unknown, the 200,000 figure is a huge hit to the industry. Roughly 600,000 people worked for U.S. energy companies at the beginning of 2015. OFS companies are tasked with actually setting up the oil wells. While many office and high-skilled employees have been laid off, it's mostly the workers laboring in the fields who are at risk. "The closer your job is to the actual oil well, the more in jeopardy you are of losing that job," said Tim Cook, president of PathFinder Staffing in Houston, to The Wall Street Journal. "Each time an oil rig gets shut down, all the jobs at the work site are gone. They disappear." Schlumberger – the world's largest OFS company – laid off the most employees this year with more than 20,000 job cuts. It laid off roughly 15% of its employees and announced it will cut more jobs next year "in light of expected reduced activity for 2016 and to streamline its support structure," according to a U.S. Securities and Exchange Commission filing earlier this month. Halliburton, which is the world's second-largest OFS company, slashed 18,000 jobs in 2015. Weatherford International Plc. (NYSE: WFT) laid off 14,000 people, or 28% of its total workforce, while Baker Hughes Inc. (NYSE: BHI) got rid of 13,000. 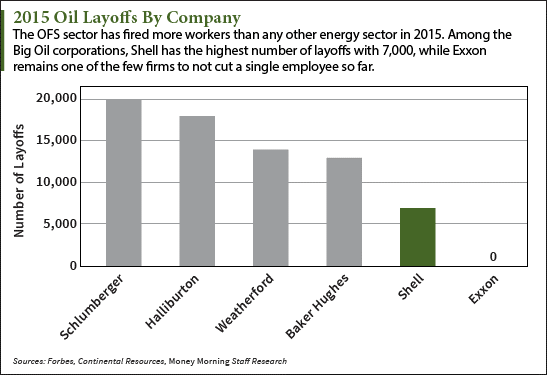 The reasons why so many oil jobs were lost in 2015 are explained in the Q3 earnings reports. Halliburton's $5.6 billion in third-quarter revenue was down 6% from the year-ago quarter. That was mostly due to the 53% crash in oil prices since October 2014. Baker Hughes reported a loss of $376 million, or $0.05 per share. Schlumberger earned $0.78 per share on revenue of $8.5 billion. That was an 11% decrease in EPS and 6% loss in revenue. "Companies are reacting aggressively to shorten the duration of the downturn," Steve Morse, a consultant with employment agency Russell Reynolds Associates, told Forbes. "These cuts are as dramatic as we've seen in this industry ever."